Bambo Nature diapers are just like ordinary disposables, but they have a much lower eco footprint. Bambo Nature nappies are both ultra-thin and ultra-absorbent with a unique layer that draws wetness away from baby’s skin, keeping baby dry and comfortable even with repeat wetting. The nappies have been designed in conjunction with parents to assure the product has a practical design and are user friendly. 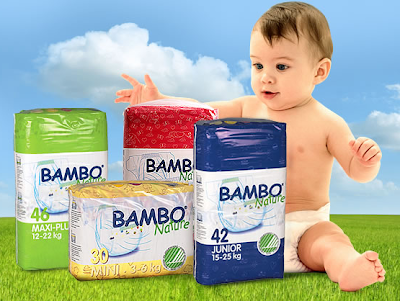 Bambo Nature is available in 5 sizes to suit all ages – from birth until your child naturally achieves full continence. For those of you that require Premie, Newborn (Size 1) and Training Pants, Abena also offers the Bambo Baby Diaper product line. Please Note: This line has been awarded the Nordic Swan Eco-Label, too! They are officially and independently certified to be environmentally friendly, just like the Bambo Nature product line. You can buy these products with the same confidence. Double leakage barriers with soft elastic which helps keep baby dry. Super-absorbent core with a unique layer that draws wetness away from baby’s skin, keeping baby dry even with repeat wetting. New flexible sidepanels with stretch for easy fit, improved comfort and freedom to move. Breathable back-sheet allows air to circulate to the skin, reducing moisture content and thereby the risk of skin irritation. We used disposable diapers for both of our children. Though I would have preferred something a little less taxing on the environment, the options weren't plentiful at the time. After using a particular brand of diapers from the time B was born for about a year, they suddenly changed the design by adding a blue dye (which brightened to show you when the diaper was wet). We continued to use the diapers after the change in design without batting an eye, however, we started to notice a rash after just a few days that was spreading from the diaper area to our sons thighs, YIKES! After a costly trip to the pediatrician we were informed that he was having an allergic reaction to the blue dye in the diaper (and a horrible reaction at that). After some research, we managed to find a brand that didn't use the dye, however, what I learned in my research in trying to find that brand was a little scary. The components and ingredients in some disposable diapers were absolutely SHOCKING! Now there is a Natural Disposable Diaper that has just been made available in the United States! Bambo Nature! Having already received vast approval from parents and environmentalists in other countries (Bambo Nature is the ONLY disposable diaper to have received the Swan Nordic eco-label), I was excited to see what they were all about. Since my children are out of diapers, we tested the diapers on a close friend's infant, and they are incredible. Not only are they soft and absorbent, most importantly there are no fragrances, dyes, or chemicals present; she can rest assured that her infants delicate skin is safe. As parent's, the safety of our little one's is constantly on the forefront from the time we learn that we're expecting. We shouldn't have to be concerned with the harsh ingredients in disposable diapers and the possible effects on our precious little one's health and the environment. 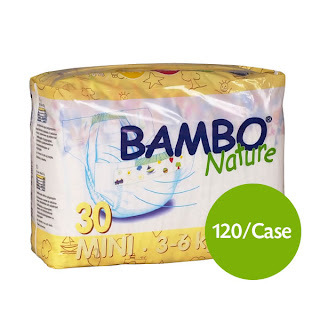 With Bambo Nature Natural Disposable Diapers we don't have to! Peace of mind and better for the environment! Visit http://www.bambo-nature.com/ and let me know one fact about Bambo-Nature Natural Diapers that you've learned. The comment is considered your entry. Entry to this giveaway ends at 12pm PST June 20, 2011. Open to U.S. Residents only. Winner's are chosen randomly through random.org.The winner will be announced in a post within 7 days of the giveaway ending, and contacted through email. The winner will have 48 hrs. to respond or another winner will be chosen. 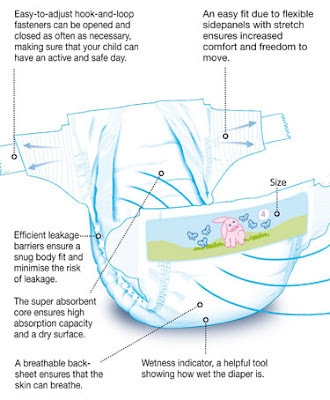 I am a follower of your blog and I learned it has a wetness indicator, which is something I miss on larger size diapers! Also, the bamboo is softer feeling that regular diapers! I love that there is no deodorants in the diapers. I am a follower of your blog. I learned that Bambo Nature contains no perfume, odor inhibitors or lotion/moisturizer in order to avoid allergic reactions. I learned Abena has designed an absorbent core with less SAP and I am a public follower via GFC. 1 I entered your GO!screen Giveaway. 2 I entered your GO!screen Giveaway. 3 I entered your GO!screen Giveaway. 4 I entered your GO!screen Giveaway. 5 I entered your GO!screen Giveaway. 1 I entered your Minky Couture Giveaway. 2 I entered your Minky Couture Giveaway. 3 I entered your Minky Couture Giveaway. 4 I entered your Minky Couture Giveaway. 5 I entered your Minky Couture Giveaway. 1 I entered your Shoebuy.com Giveaway. 2 I entered your Shoebuy.com Giveaway. 3 I entered your Shoebuy.com Giveaway. 4 I entered your Shoebuy.com Giveaway. 5 I entered your Shoebuy.com Giveaway. 1 I entered your Zutano Giveaway. 2 I entered your Zutano Giveaway. 3 I entered your Zutano Giveaway. 4 I entered your Zutano Giveaway. 5 I entered your Zutano Giveaway. 1 I entered your Magic Cabin Giveaway. 2 I entered your Magic Cabin Giveaway. 3 I entered your Magic Cabin Giveaway. 4 I entered your Magic Cabin Giveaway. 5 I entered your Magic Cabin Giveaway. I learned that they are certified free from harmful chemicals!